After announcing his resignation at the request of President Trump on Wednesday, Attorney General Jeff Sessions exited the United States Department of Justice surrounded by standing and cheerful colleagues. 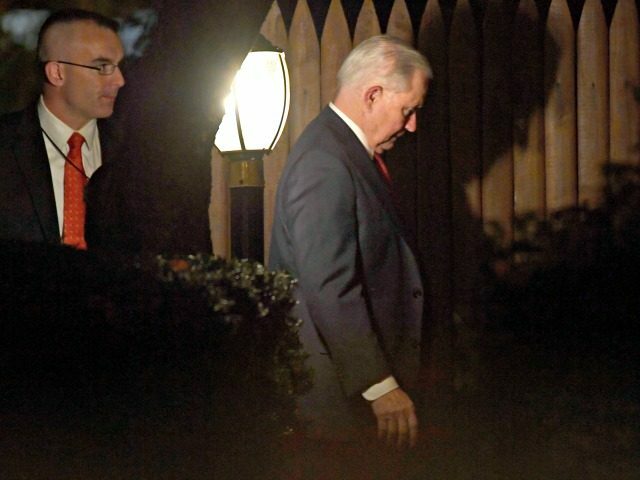 The clip shows Sessions shaking hands with his chief of staff Matthew Whitaker, who is set to replace him as acting attorney general. Other Justice Department officials attended the publicized exit of Sessions, including Deputy Attorney General Rod Rosenstein. In a tweet on Wednesday, President Trump announced Matthew Whitaker would take over as acting attorney general. Whitaker will now take on oversight of Robert Mueller’s probe, which Rosenstein had been watching over since Sessions’s recusal last year.